Since the inception of pancreas transplant as a treatment for type 1 diabetes mellitus, there has been considerable debate about the best way to manage exocrine secretions and monitor patients for graft rejection. For patients who undergo bladder exocrine drainage of a pancreatic allograft, a bladder-to-enteric drainage conversion can serve as a rescue procedure in case of anastomotic leaks or other complications. However, this procedure is associated with its own complications, including a rarely described entero­vesical fistula. Here we report on a 45-year-old man who underwent a simultaneous kidney and pancreas transplant with bladder drainage to the latter. He developed a pancreatic allograft duodenal leak (duodenal-vesical anastomosis) requiring a bladder-to-enteric drainage conversion. The patient returned 2 weeks after discharge with an enterovesical fistula. He was treated nonsurgically with intravenous antibiotics, bowel rest, and parenteral nutrition, and the fistula successfully closed in approximately 2 weeks. Overall, enterovesical fistula formation is a rare but treatable complication that can occur after a bladder-to-enteric drainage conversion of a pancreatic transplant allograft. It can be managed nonsurgically, which is preferable in these immunocompromised patients. The inadequate management of exocrine secretions is a major source of complications associated with pancreatic transplant. The primary mode of drainage has changed over the years. In the early days of pancreas transplantation (1960s-1980s), surgeons attempted segmental pancreas transplant accom­panied by various forms of exocrine drainage, including peritoneal drainage, pancreatic duct ligation or intraductal injection with a polymer, and pancreatic duct-to-ureter anastomosis. However, these techniques were associated with the com­plications of peritonitis, intra-abdominal abscesses, graft pancreatitis, and graft failure. In the early 1980s, Hans Sollinger introduced and popularized whole-organ pancreaticoduodenal transplant with bladder drainage, and this technique became the primary mode of pancreas transplant in many centers around the world.1,2 However, during the past 20 years or so, this drainage method has fallen out of favor owing to the incidence of multiple urinary, pancreatic, and metabolic complications such as reflux pancreatitis, metabolic acidosis, dehydration, hematuria, anasto­motic leaks, recurrent urinary tract infections, and urethral strictures.3-7 As a result, most centers have switched to using enteric drainage in these patients. For patients who have bladder drainage of the pancreatic allograft, a bladder-to-enteric drainage conversion procedure remains an option when complications arise. In general, approximately 7% to 31%5,8,9 of patients subsequently require conversion from bladder to enteric drainage, with which an approximate 15% complication rate is associated.5,10 Complications that typically arise after bladder-to-enteric drainage conversion include anastomotic leaks, bowel perforations, intra-abdominal abscesses, graft pancreatitis, and graft pancreatectomy. We found 2 cases of enterovesical fistula following a bladder-to-enteric drainage conversion reported in the literature,3,10 making this a rare complication. 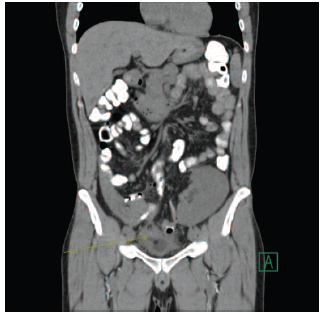 A 45-year-old man with type 1 diabetes mellitus and diabetes-related end-stage renal disease underwent a simultaneous kidney and pancreas transplant with bladder drainage in March 2012. His other medical history included anemia, hypertension, and transient ischemic attack. He responded well to the surgery initially, but at 18 months posttransplant, he experienced recurrent graft pancreatitis. About 6 months later, he presented with gross hematuria. 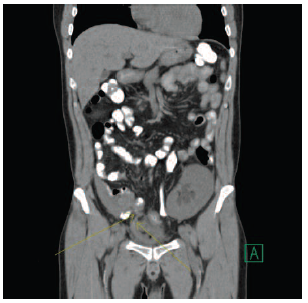 He underwent a cystoscopy and retrograde urethro­gram, which showed severe urethritis. A Foley catheter was placed, and the patient was discharged from the hospital. 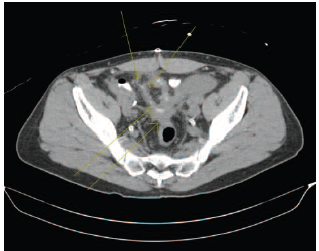 The patient returned to an outside hospital 2 days later with worsening lower abdominal pain, and a computed tomography (CT) cystogram demonstrated bladder leakage. He was transferred back to the main hospital, at which point the decision was made to proceed with enteric drainage conversion. After enteric conversion, the patient had an uneventful postoperative course. An oral diet was introduced on postoperative day 5 after the patient had regained his bowel function, the Foley catheter was removed on postoperative day 7, immuno­suppression was maintained using tacrolimus and mycophenolic acid, and the patient was discharged on postoperative day 8. However, he was readmitted to the hospital 2 weeks later, after presenting with fever (101.5°F), nausea and vomiting, right flank pain, and pneumaturia and foul-smelling dark brown urine. Laboratory data showed elevated serum creatinine (2.7 mg/dL compared with 1.7 mg/dL the week prior), amylase (227 U/L), lipase (1285 U/L), and white blood cell count (14.5 ×103/μL). Urinalysis showed significant pyuria, and a urine culture grew extended-spectrum beta lactamase Klebsiella pneumoniae. He underwent a CT scan with oral contrast that showed an enterovesical fistula, with no overt fluid collection (Figures 1 to 3). Because the patient was otherwise stable but immunocompromised, it was decided that nonsurgical therapy would be tried first. A Foley catheter was placed, the patient was given nothing by mouth to effect bowel rest, and he was started on parenteral nutrition. In addition, owing to concerns about a possible ascending genitourinary infection, the clinicians decided to keep him on intravenous ertapenem until the fistula closed or he required surgical intervention. He was maintained on tacrolimus and mycophenolic acid for immuno­suppression. After 2 weeks, the Foley catheter was removed and clear liquids were introduced. At his 1-month visit, antibiotics and total parenteral nutrition were discontinued, and his diet was liberalized because there was no evidence of a persistent fistula at that time. He continues to do well. Enterovesical fistulas often appear as a result of a chronic inflammatory pocket developing next to the urinary bladder because of some inciting agent (eg, radiation, neoplasm, inflammatory bowel disease, diverticulitis). In this case, the patient appeared to develop a pelvic inflammatory pocket due to a small pelvic abscess or contained anastomotic leak, resulting in the formation of an enterovesical fistula. By keeping the patient on intravenous antibiotics and optimizing his nutrition parenterally, we were able to heal his fistula. Enterovesical fistula formation is a rare com­plication that can follow enteric drainage conversion of a pancreatic allograft. Here, we report the third occurrence of such a complication in the medical literature. The other 2 cases were observed at the University of Wisconsin and the University of Minnesota in the 1990s3,10 and were treated surgically with urinary diversion and drainage and total parenteral nutrition. Most enterovesical fistulas are seen in the setting of complicated diverticulitis and inflammatory bowel disease.11,12 Although enterocu­taneous and enteroenteric fistulas are generally managed nonsurgically, most surgeons and gastro­enterologists agree that enterovesical and other urologic fistulas warrant surgery because of the risk of renal damage and other comorbidities.13 However, transplant patients have added comor­bidities due to immunosuppressive therapy, which impairs healing. Therefore, any surgical intervention in this popu­lation must be undertaken with great caution. In addition, surgical techniques for repairing an enterovesical fistula should aim at resection and reanastomosis of the affected bowel segment as well as repair of the bladder opening, with or without a diverting enteric stoma. Surgical intervention for enterovesical fistula after enteric conversion of a bladder-drained pancreas allograft can be very challenging. Options include taking down the duodeno-enteric anastomosis, creating a Roux-en-Y duodeno-enteric anastomosis, and repairing the bladder. One can also attempt to reconnect the transplant duodenum to the bladder, including resection and reanastomosis of the involved small bowel segment. Another option is to perform a transplant graft pancreatectomy with resection and reanastomosis of the involved small bowel segment. The immunosuppressed status of these patients, the high likelihood of having a contaminated surgical field, and the increased risk of ischemia to the duodenal segment of the pancre­aticoduodenal allograft are all factors that increase the chance that surgical management will fail, requiring a graft pancreatectomy. Therefore, all attempts should be made to treat these patients conservatively. In this patient, we were able to successfully close the fistula in just a few weeks with adequate nutritional support and infection control. Enterovesical fistula formation is a rare complication that can occur following a bladder-to-enteric drain­age conversion of a pancreatic allograft. Treating these patients requires early recognition and diagnosis with the aid of a CT scan. Conservative management consisting of decreased oral intake, nutritional supplementation, and, if needed, intravenous antibiotics is recommended in stable patients. Sollinger HW, Stratta RJ, D'Alessandro AM, Kalayoglu M, Pirsch JD, Belzer FO. Experience with simultaneous pancreas-kidney transplantation. Ann Surg. 1988;208(4):475-483. Sollinger HW, Knechtle SJ, Reed A, et al. Experience with 100 consecutive simultaneous kidney-pancreas transplants with bladder drainage. Ann Surg. 1991;214(6):703-711. West M, Gruessner AC, Metrakos P, Sutherland DE, Gruessner RW. Conversion from bladder to enteric drainage after pancreaticoduodenal transplantations. Surgery. 1998;124(5):883-893. Jimenez-Romero C, Manrique A, Meneu JC, et al. Comparative study of bladder versus enteric drainage in pancreas transplantation. Transplant Proc. 2009;41(6):2466-2468. Hakim NS, Gruessner AC, Papalois BE, et al. Duodenal complications in bladder-drained pancreas transplantation. Surgery. 1997;121(6):618-624. Medina Polo J, Morales JM, Blanco M, et al. Urological complications after simultaneous pancreas–kidney transplantation. Transplant Proc. 2009;41(6):2457-2459. Friedrich J, Charpentier K, Marsh CL, Bakthavatsalam R, Levy AE, Kuhr CS. Outcomes with the selective use of enteric exocrine drainage in pancreas transplantation. Transplant Proc. 2004;36(10):3101-3104. Kukla A, Radosevich DM, Finger EB, Kandaswamy R. High urine amylase level and the risk of enteric conversion in solitary pancreas transplant recipients. Transplant Proc. 2014;46(6):1938-1941. Van der Werf WJ, Odorico JS, D’Alessandro AM, et al. Enteric conversion of bladder-drained pancreas allografts: experience in 95 patients. Transplant Proc. 1998;30(2):441-442. West M, Gruessner AC, Sutherland DE, Gruessner RW. Surgical complications after conversion from bladder to enteric drainage in pancreaticoduodenal transplantation. Transplant Proc. 1998;30(2):438-439. Pugh JI. On the pathology and behaviour of acquired non-traumatic vesico-intestinal fistula. Br J Surg. 1964;51:644-657. Golabek T, Szymanska A, Szopinski T, et al. Enterovesical fistulae: aetiology, imaging, and management. Gastroenterol Res Pract. 2013;2013:617967. Mulholland MW, Doherty GM. Complications in Surgery. 2nd ed. Philadelphia: Wolters Kluwer/Lippincott Williams & Wilkins Health; 2011.